Posted 22 December 2010 in Bonus, Cooke Looks, The Forever People #2. 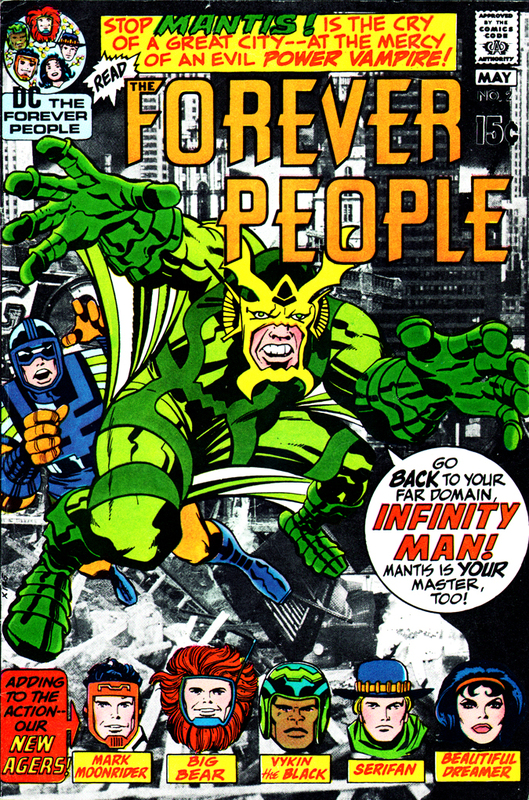 Jack Kirby starts to loosen up in this second issue of The Forever People, after a somewhat constricted-feeling debut number, but the creator does come dangerously close to formula in having his fantastic characters deal in a mundane setting of everyday Earth (in this instance, the rundown neighborhood of Donnie and Uncle Willie), then encounter a strange new super-villain (Mantis) and combine into The Infinity Man to defeat said baddie, all tied neat in a bow by page 22. Frankly all three of the new titles have a slightly pat air about them but, by the third issues, it’s as if Jack flushed the formulaic, traditional comic-book approach clean out of his system, because by then, pal, all bets are off! Still, however rote the plotting, it is a great pleasure to have the gang checking out regular folks on our humble planet. The traffic jam episode, chatting with Donnie, moving into the new digs — all these sequences are great fun, and it was again a pleasure when the Super-Kids got to briefly hang out with Trixie Magruder later in the run. As somewhat stereotypical as Donnie is, there is an earnestness I can relate to and it would’ve been a hoot to return to him, too, in the future. Not too much to expound on here, though it must be said Mantis is an excellent villain and The Infinity Man, as always, is a marvel to watch in action. But the meat of this issue is the foreshadowing with the appearance of that guy we never tire of seeing, Darkseid, and an ominous new bad guy from Apokolips, Desaad. Reading this issue as a kid just made me want more. The storytelling clips along nicely, the action in the usual top Kirby form, and a momentum is starting to build. What I didn’t realize, reading these as they appeared on the newsstand, was that a veritable tsunami was fast approaching with the Glorious Godfrey/Happyland epic, which made The Forever People a transcendental title, one that was dealing with hugely adult and pertinent issues, a transformation that frankly changed me. Obviously, writing about this all four decades later, I still marvel at Jack’s achievements. Get ready, kiddos, it’s rising on the horizon, so grab some flotation devices, will ya!!!! As you said, Jon, Mantis is an excellent villain, with a very cool costume. He’s so good, in fact, that I’d definitely put him in the upper echelon of Fourth World bad guys — right up there with Darkseid, Desaad and Kalibak. And this issue also features what is, in my opinion, the best, most consistent ink job that Vince Colletta turned in during his entire run on the Fourth World saga. I’d love to have seen what Mike Royer could have done with those pencilled pages, but Vinnie’s work was pretty good this time around, so I don’t think we missed out on very much (for a change).